Future changes in energy supply, use and conservation in buildings will have complex impacts on various indoor environmental exposures. As part of the PUrE Intrawise project, methods are being developed to study the consequences of such changes on human health. It is important to understand how strategies to increase energy efficiency and reduce greenhouse gas emissions from dwellings will impact on human health. For instance, making buildings increasingly airtight to reduce energy consumption will have implications for ventilation, which may in turn adversely affect indoor air quality. Methods to estimate the impacts on health of changes in the future are useful tools to help the development of appropriate policies. Exposures to various indoor environmental factors, including several air pollutants, environmental tobacco smoke, radon, mould and temperature (extremes of heat and cold), have been associated with a wide variety of health outcomes. The health impacts include mortality, respiratory illnesses (such as asthma), cardiovascular disease and lung cancer. LSHTM has developed a quantitative health impact assessment methodology to estimate the effects on human health of multiple indoor exposures. The model considers effects on both population mortality and morbidity. The model is based on life tables. These methods, used in actuarial science, calculate the probability that individuals will survive to their next birthday, based on age-specific mortality rates. For a population, the primary outputs of a life table are the average remaining life expectancy at a given age, the proportion of the population expected to still be alive at that age and the pattern of deaths over time. The standard life table has been expanded to create a new multi-state life table, within which members of the population can exist in healthy and non-healthy states and move between these states over their lifetime. Recovery from and relapse to diseases is also permitted. 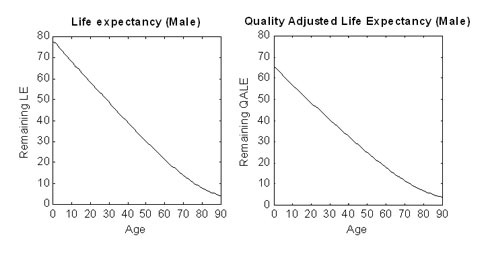 This allows the estimation of a “quality-adjusted” life expectancy in which time spent with disease is weighted to account for the reduced quality-of-life. Many indoor exposures result in chronic diseases. As such, in order to develop appropriate policies, it is vital to take into account reduced quality-of-life with such conditions. 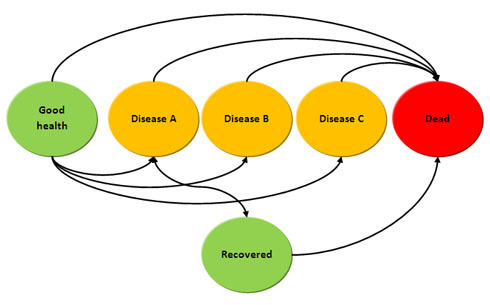 Using predicted exposure changes for future scenarios, the new life table method can be used to estimate the resulting changes in quality-adjusted life expectancy, mortality and disease patterns. In PUrE Intrawise, the health impact model is being used to assess the impacts of various future scenarios, including the effects of increasing energy efficiency in buildings, moving from gas to electricity (modal switching) and increasing microgeneration of energy. For further information about this study please contact Dr James Milner.